At one time downtown Peoria had three classic and historical movie theaters, the Rialto, the Madison and the Palace Theater. Only the Madison is still standing, but it’s doors have been shut since 2003. The Palace Theater stood at the corner of Main and Jefferson and I found some photos of it online and thought I’d post them and then take a trip to another Palace Theater that’s still standing tall on another Main Street in Elmwood, Illinois. 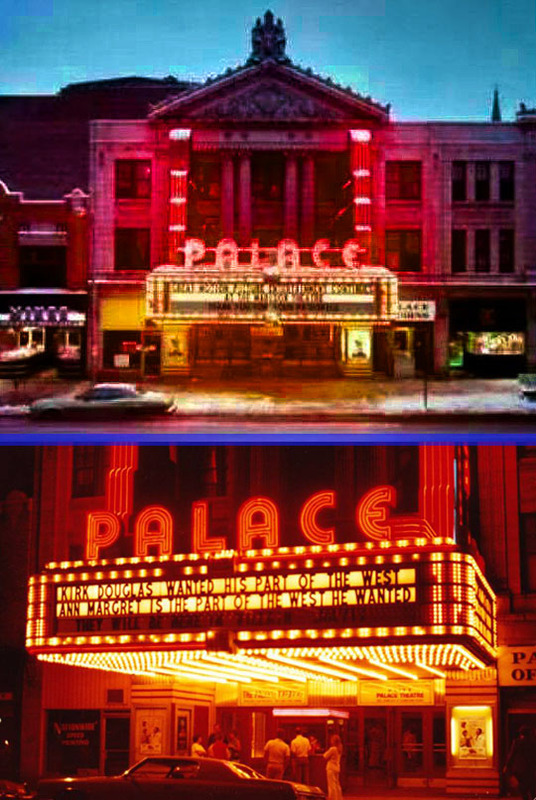 Hold on to your seats as we begin this Tale of Two Palace Theaters! Here’s some black and white photos of the theater I found and the bottom photo shows the elegant interior. I love this ticket from 1964 to view the Sonny Liston vs. Cassius Clay fight. This was a legendary boxing match and five dollars was pretty expensive for a ticket back then. You can read more about this historical boxing match right here. These are some newspaper ads from the past that feature the Palace Theater. I love the tagline for The Poseidon Adventure: “Hell, Upside Down.” What does that even mean? This is a great shot of downtown Peoria I found online. I forgot that there was a Sandy’s on Main Street! There’s the Pere Marquette, the First National Bank, The Palace Theater and down the road you can see the Madison Theater. This photo is from a 1968 Richwoods High School yearbook. Wow, this is a sad photo. It’s the Palace Theater being torn down in 1981. It was torn down after a fire in the building and the Twin Towers is now standing in this part of downtown Peoria. Alright, time for the second feature! The Elmwood Theater was built in 1913 and has had two lives. The theater was damaged on June 5th, 2010 by a tornado that hit the town and the roof collapsed and damage was done to the west wall. The residents of Elmwood rallied around the theater and formed a “Save the Palace Theater” committee to help rebuild the theater. They raised more than $8,000 and about a year later it reopened. Bill Seipel took this shot of the marquee shortly before the theater started its second act in 2011. You can read more about the reopening here. 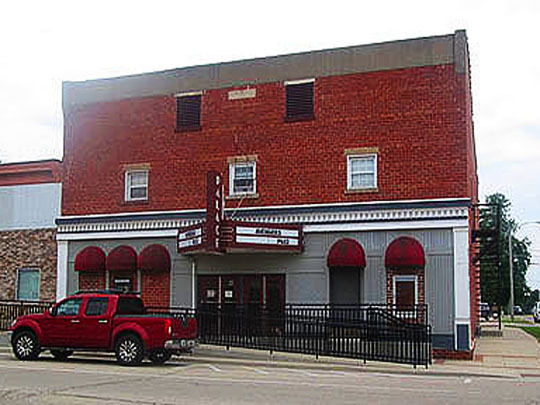 Here’s the theater today, standing tall at 122 West Main Street in Elmwood, Illinois. They did a great job of rebuilding it and I love the old-school look of the theater and the marquee. Let ‘s go in and take a look around! This is the lobby and behind the box office is Shelly, who’s giving us today’s tour of the theater. There’s a concession stand out here and coming attraction posters. Down the hall is the entrance to the theater. This is the Theatre Room and it’s very dark in here. It’s such a classic theater and you feel like you’ve gone back in time standing in here. The balcony is open and it’s a spectacular view from up here. Shelly said these seats have been up here for decades. Shelly showed me photos from the aftermath of the tornado. 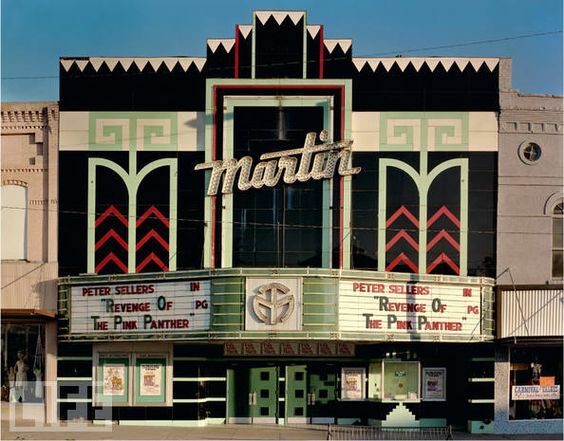 It’s so great that this piece of movie theater history got rebuilt and is still standing. This theater is less than a half an hour away from Peoria, so if you feel like seeing a movie, you should take a drive and help support it. For more information you can visit their website and facecrack page. Here’s the marquee all lit up at night! Thanks to Shelly Brodine and Bill Seipel for the photos and tour! We’ll see you all tomorrow! Related Posts: A Private Tour of the Apollo Theatre, It’s A Wonderful Theatre, Starring the Chillicothe Town Theatre and Places In Peoria: The Madison Theater.